Peak District Online are the true Peakapedia of knowledge about all things Derbyshire. With a website attracting over 200,000 unique visitors each month and with the numbers still growing, their popularity is proving hard to resist. Not content with improving and constantly updating their flagship website, the team at PDO are also striving to add more features and other websites portraying the Peak District. The latest in their 'Let's go Peak District Villages' offshoot websites is launched live today and it's all about Chatsworth. 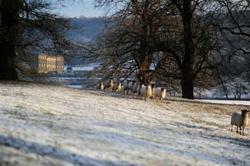 The new website all about Chatsworth goes live today. A brand-new website celebrating the charms of Chatsworth goes live today and Peak District Online toast to its success. http://www.letsgo-chatsworth.co.uk is one in a long line of planned websites depicting the wonders of Derbyshire and each Peak District village in the 'Let's go' range. Already attracting more unique visitors every month than ever before, the popular Peak District Peakapedia adds to its website portfolio each week and endeavours to uncover every single village and hamlet throughout Derbyshire in their long-running plan. "It's been something we've been wanting to do for a very long time," says James Dobson, director and Peak District wildlife photographer for Peak District Online. "We started PDO several years ago and what started life as a very small, close-knit family run business, has now turned into a monster of a website with more and more staff, writers, researchers and salespeople, adding to the biggest directory of Peak District holiday accommodation than any other website in the UK. The spin-off websites that we have started recently, the 'Let's go' range, go into a lot more detail about each village, depicting its history, where to go to eat and drink, the shops, directions of how to get there and any other information we can get hold of." http://www.letsgo-chatsworth.co.uk delves into the history, famous people of Chatsworth, the different estates, the farm shop and of course the stunning house and gardens, digging up information, facts and figures to enlighten their audience. The new website goes live today with promises of lots more pages being added over the next few weeks. "There are so many interesting facts, references to famous people and unusual acquaintances, which even include President Kennedy of the United States of America," explained Steve Wake, fellow director at Peak District Online. "I thought I knew almost everything about Chatsworth, having written so much about the estate for Peak District Online, but even I have learnt an awful lot more which is featured in our new Let's-go Chatsworth website. Everything we seem to uncover, revolving around this stunning property, generates a lot of interest and we hold it very dear to our hearts but so do visitors from all over the world. There's just something so special about the place. It's been a real pleasure and privilege to go up there and have access to all areas, to take photographs and gain an insight into life there, but also to be able to get the chance to report on what Chatsworth is really like." The masters of making videos portraying Peak District Villages, holiday accommodation and places to go and people to see in the Peak District, Peak District Online's most viewed video on YouTube is actually the 'Inside Chatsworth' video, which has attracted over 20,000 views, up-to-date. "We'll be adding to the pages over the next few weeks, and if any more events and attractions, or such as the wonderful art exhibitions which take place frequently, and news about other bits and bobs that happen constantly at Chatsworth, then our website will be one of the first to shout about it. So keep popping back and keep up-to-date." The new website all about Chatsworth goes live today and the company's additional information which can be found on the Peak District Online website.